While announcing a big anniversary march on Saturday, March 30, Hamas caught Israel by surprise on Friday night, when a 240-firebomb blitz was aimed for five hours at Israel troops by just 200 Hamas terrorist pros. Hamas then proceeded to stage a “restrained” event at the scheduled time on Saturday. Bracing for the worse the next day, the IDF Friday night was satisfied with firing just three tank shells at a Hamas position. But people living in the vicinity of Gaza reported that on Friday night the earth and the walls of their homes shook as never before under the impact of the ferocious Hamas blitz. Since the main event was still ahead, Israeli officials and commanders were satisfied with a muted response. 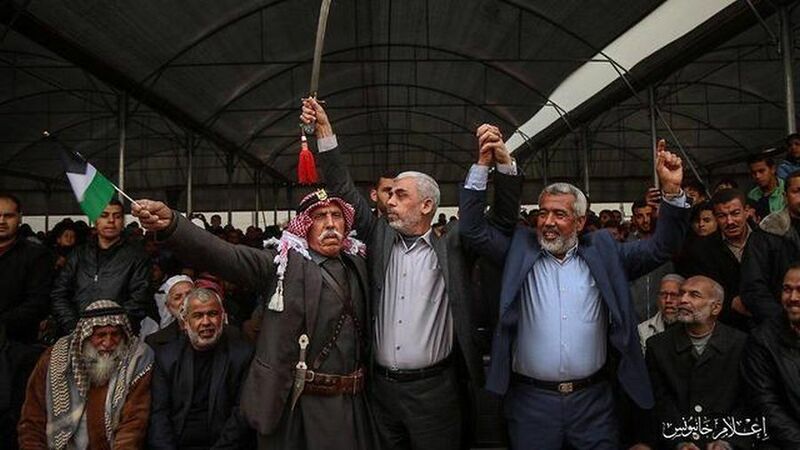 But the fierce assault the night before enabled Hamas leader Yahya Sinwar to strut at the head of 40,000 Palestinians on Saturday and claim victory in the contest. “Israel is now on trial,” he told the cheering masses. “Next year’s March of Return demonstrations will be nothing like this year’s!” he shouted. Since by Saturday, the main event was relegated to the past and Israel’s reprisal was a non-event, Hamas could claim credit for staging the March of the Million with restraint, its operatives conspicuously scurrying about in the crowd and pushing them back from the Israeli border fence. Although three Palestinians were killed by Israeli fire and scores injured, the terrorists could signal the Egyptian truce brokers that they had behaved reasonably, and it was now up to Israel to make the running. This Hamas scam was the epitome of low, malign cunning. If Israel and the IDF prove willing to swallow the humiliation meted out to their prized Golani and Paratroop units at by Palestinian terrorists without an appropriate response, they should not be surprised to find people starting to believe the lie propagated by Hizballah leader Hassan Nasrallah that the IDF is no longer fit for ground combat and its commanders are afraid to send the troops into battle. Perhaps the last word is still to come. It was announced that the strength the IDF massed over the past week around the Gaza Strip is to remain in place in the coming days. Total Hamas victory, Israel is kaput! Two three more victories like that Trump declares Jerusalem to capital for Hamas. But, sorry, no Jews in Hamas, not allowed. He’s very se xy, and with that sword, who’s he? Yes, yes, firebomb big explosions scary ants in a circle of minimum 3,000 milimeters, sometimes even larger! It is almost 9:00 PM, very late, why don’t you go for pipi and then to bed? What exactly did Hamas prove? That it can toss firebombs? Maybe a few of them should try out for MLB pitching. They proved that it is very heroic to burn tires and the national sport to throw stones is now perfected to a art in the same family with ballet. Then, they really proved to master the know-how to fake victory meetings of 20 and leave an impression they were almost 50 or even more. Looking forward…. to the next round.The never ending story part…..
Israel can’t please the world – if they show restraint they’re cowards; if they exercise force it’s an “over-aggressive, non-proportional” response. Israel must do what it does best – protect Israel. Ezekiel 38, 39 is coming, when God breaks his silence and destroys Israel’s enemies. yeah, why load yourselves up, jew bo_llocks? you’ve spoken truth. Israel is under a microscope and even america has antisemite’s in congress and even though their being punished for being vocal and without a real apology they still ferment and idiots follow them like lemmings. God hasn’t forsaken that tribe of Israel. there are more from the “lost” tribes being enlightened mostly due to dna / ancestor searches…couldn’t do that until recently. another fullfilling of end time prophecy..so it’s the beginning of sorrow’s america will fall before the return of messiah sad to say but look at what america espouses and the society that media etc promotes…decadent..past the tipping point even Trump can’t stop it now.. The Arabs should thank their lucky stars Israel has resolve. Total decimation is within easy reach. True. The fakestinians should be grateful that the Israelis are not like them. This “problem” would have ended years ago. There would be not one left. Said as your gang-banging antisemites murdered three children. sad that your hatred makes you actually believe that 3 terrorists attacking soldiers at a border are “children”. NuttyYahoo knows his impotent squatter army of antisemites would get pulverized. stoopid comments from a stupid troll. israel exists despite all the “victories” of her antisemitic neighbours. I like the sword in the picture! It is obviously blunt, which says a lot – this is a sword of peace, more precisely the Oslo Accords Sword. But, most of the people around have long and serious expressions, not to mention the two at the left down corner, they appear to cry. Israel should make all the inhabitants of Gaza swim for safety and see how many survive. This is what they deserve. Maybe some will drown before the sharks eat them. Otherwise they have the choice to move somewhere else. Put music to those words, Jay, . . . they could become a hit song, . . . but then again the fakeistinians can’t swim, . . .
Good job of killing kids, attacking ambulances, and attacking the press! running out of plausible lies? There must bee 2 states. And Arabs living prosperous in a state of less terrorism and less auto-destruction, if possible, on their lands the other side of the Jordan river and all along the thousands kilometers from the Nile to the Atlantic ocean. uh, yeah, right. jordan, israel, and fatahland? that’s three, not two. plus hamastan makes four. and why should that make peace? israel withdrew from gaza in 2005, has that led to peace? the problem isn’t israeli “occupation”, which hasn’t existed since oslo, but the very real and brutal occupation by fatah and hamas terrorists, who want nothing but death. israel isn’t the problem, israel is the solution. Israel is right on beeing calm. And never send ground troops to Gaza prior a well done bombing of the Hamas subway system as.the try tro provoke and to abduct soldiers. So keep out of Gaza and.wait. And if needef strike but strike hard with no prior warning. Use MOAB and other means to flatten Gaza and when the population sank by a ratio of 10 or more go in and finish them off, as the carcases start to rot quickly in the sun go in just after the bombings them if the job is done by the ground troops switch off gas, water and electricity and declare gaza off limits for any human beeing because of pests. Wait 10 years for the carcases to decompose and the pests to die off. After that get a lot of catapillars to push the dirt into the sea, thus building an artificial island to add for the beach resort to be build where the fakestinians were.